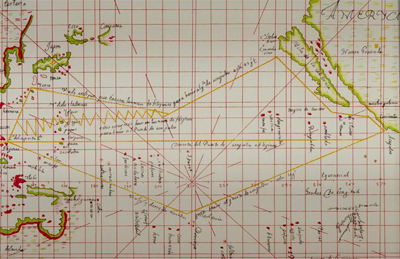 The duration of the voyages of the Manila Galleons between Acapulco and the Strait of San Bernadino, Philippines, from 1590 to 1750. The solid curve indicates the 30-year running average. Dashed curves are 95% confidence bands. Wind composites for the 9 slowest and 9 fastest "virtual voyages" between Acapulco and the Philippines. Fast voyages are made when the southwest monsoon trough (dark blue/purple area) is pushed southward, allowing the ships to reach the Strait of San Bernadino with the trade winds. When the monsoon trough is pushed northward, winds are unfavorable, thereby delaying the approach to the Philippines. A better understanding of how present climate can change and increased awareness of the full range of climate variability are crucial to improve forecasting of weather, climate and extreme events. However without records of wind, temperature, rainfall, humidity and other weather characteristics, accurate descriptions of past climate are difficult. Scientists working in the field of paleoclimatology have turned to natural records of climate, such as the sediments at lake bottoms, the widths of tree rings, and the chemicals stored in glacial ice or coral reefs to piece together a story of Earth's climate before the era of instrumental measurements of climate and weather conditions. A subfield of paleoclimatology, historic paleoclimatology, reconstructs past climate conditions from historical references and documentary evidence, such as church records, harvest dates, or harbor ice-free dates. 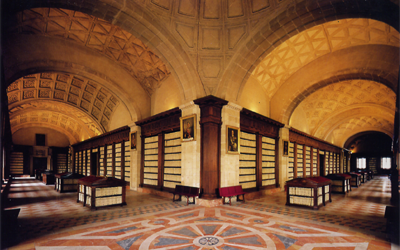 This approach was used by the study's international team of nine researchers while working in Spain's General Archive of the Indies (Archivo General de Indias). For the first time, scientists turned to the sailing records from Manila galleons to learn about past climate. "This idea started with the knowledge that these voyages had taken place, and that there are very few observations of climate before 1800," said Henry Diaz, a lead researcher for the project who works at NOAA's Physical Sciences Division. "We were thrilled to find that these records could give us a unique look at climate of the Pacific Basin during the few hundred years prior to large-scale weather observing." After compiling data on how long each ship's journey lasted, the researchers first asked whether other factors besides wind and weather - such as changes in how ships were built, what sort of cargo they carried, or what route they traveled - could have made a difference in how quickly the ships sailed. A lengthy investigation of other historical documents, including letters and journals, showed that these factors stayed mostly the same over the period of time the researchers were examining. Confident that changes in the length of each journey would be mostly influenced by climatic conditions, the team then looked at how voyage length changed with time. They found a revealing pattern of change in voyage length, with voyages during the 30-year period of 1640 to 1670 lasting substantially longer than voyages before or after this period. From 1640 to 1670, voyages were around 123 days long, compared to a length of 79 days for voyages taken from 1590 to 1620. 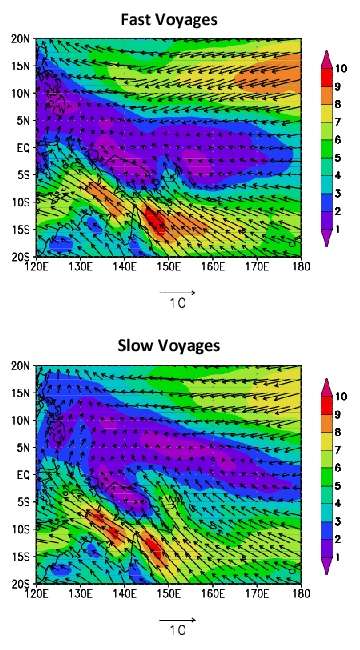 To learn what climatic impacts could be contributing to longer voyages, the team constructed virtual voyages, in which a computer program sailed a ship with the same build and cargo as one of the historical galleons along the historical route, but used climate data measured during the last 50 years to define the winds and storms the virtual ships encountered. Careful examination of the climate patterns that slowed the ships down or speeded them up showed that the primary explanation for slow voyages was the strength of the southwest winds the ships encountered when arriving in Manila. Traveling eastward to Mexico, the ships rode on the westerly winds. Returning west, the ships would sail with the northeast trade winds. The trip west depended critically on the circulation over the western Pacific, and was key in determining the total length of the journey. With stronger trade winds, the ships had a straight shot. But if the monsoon trough moved up and got in the way of the trade winds, the ships would have been slowed considerably. 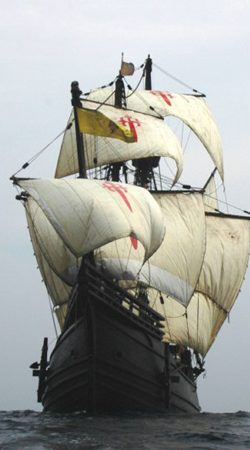 The connection between the speed of the Manila galleon ships and the strength of the trade winds indicated to the researchers that slower voyages most likely represented an earlier onset of the monsoon season. The observed changes in voyage length suggest that profound changes in atmospheric circulation of the western Pacific took place during the seventeenth century, and that these changes were larger than anything experienced during the last 50 years. "Hopefully this study, along with other research efforts taking place in China and in South America, will foster the international cooperation needed to fully explain these changes in tropical circulation," Diaz said. "With a better understanding of how circulation patterns have changed in the past, we'll be better equipped for forecasting and preparing for extreme weather patterns."